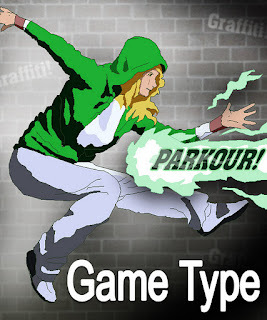 Game Type has been updated with a slew of small and large improvements! Most of these improvements are in the shoot'em up portion of the game. The biggest changes come to the gameplay in the form of the weapons and point system. Before, Cash Drops only gave the player extra points. Now they still give you score bonuses, but additionally they fill a meter shown in the HUD. This meter powers your Kick Beam and the new Time Pulse. In addition to the normal and beam weapons, you can use a new action called "Time Pulse". This slows down time dramatically for just a moment, giving you a chance to dodge out of the way. Using Time Pulse takes 51% of your cash meter (which is marked by a yellow star letting you know Time Pulse is ready). You'll have to grab more cash drops to use it again. But that should be easy since now shooting enemy bullets with your Kick Beam, while in the slowed-down mode, turns into Cash Drops! That's right, shooting enemy bullets turns them to cash! 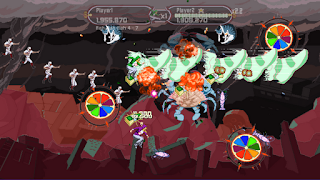 Use the Kick Beam during the time slow-down and change enemy shots to Cash Drops! The new player basic shot can attack top, bottom, and forward! In addition to the gameplay and art changes the online High Scores Tables are fixed and will now share properly for all scores! Take 2 players into the madness! High scores properly share now for scores past loop 3. 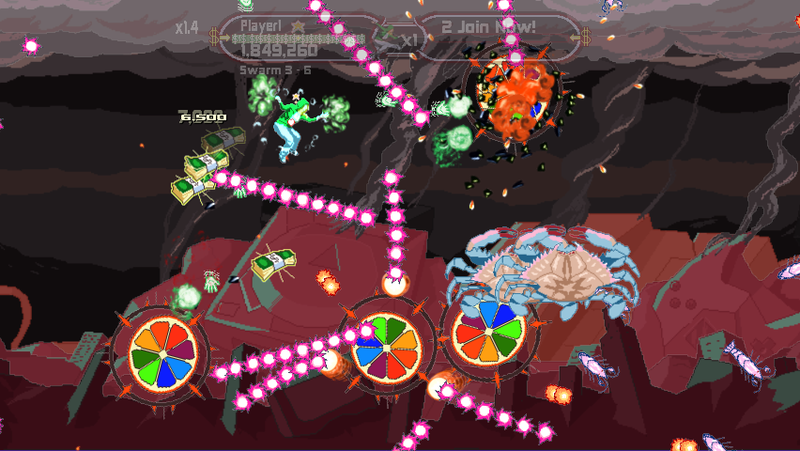 Weapons system changes: Normal shot now has up/down shots plus forward firing, and is stronger. Kick Beam is now powered by Cash drops. Also, new attack added via the Right Trigger called "Time Pulse" which slows time and lets the Kick Beam turn normal enemy bullets into cash. Add action buttons are remappable. New 'How to Play' screens (2), these are now shown via menu option during gameplay as well. New Score Multiplier system which works by increasing for every cash drop you grab, but drops if you don't get them fast enough. Warning arrows are shown for enemy groups beginning to approach off screen. Players can "log in and log out" on the shmup sub-menu screen. Find the Game Type menu with box art showing (the menu in which you're about to play the shoot'em up). Players can press A to join or press Y to log out. If two players are playing, and one needs to quit use this to get the second player to log out. Graphical touch-ups: green theme used on beam attacks and bullets. Background art touched up with more detail and highlights. Gameplay tips are now shown during loop starts. 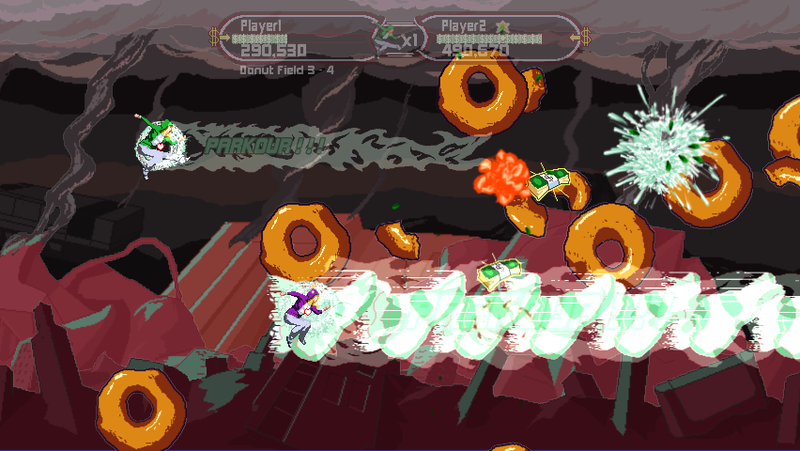 The wave spawning for enemies have been rebalanced for more consistent, interesting attacks. The 'hint arrow' in the fake dashboard now starts on by default (to make it easier to find the shmup game). There is a quick-start option now, just press Y to launch shmup game, if you've already found it and played it once. Pressing B repeatedly on the fake dashboard will eventually take you back to the exit menu. Here's a Xbox 360 marketplace link to the update: Link. Game Type is 80 MS Points which allows for the ability to share your high scores online. The game was originally released December 21st. This is the first update for the game. Hi, so I've put together a simple post pleading with developers and gamers to focus their internet super powers on getting the ESA to drop SOPA support. If They can get the Ocean Marketing guy fired forever, I'm sure They can blow this up as well. I feel like because the ESA is one step removed from direct consumerism, it's not getting the heat like it should be. Yet, when Congress looks as the SOPA support list and sees the ESA, "Yes, there's the game industry, right there." If you work for any of the companies that are ESA members, please talk to your higher ups about contacting the ESA to have them withdraw SOPA support. In effect, your company is supporting the SOPA bill. There are over 30 really great companies that have made amazing games that are effectively supporting the SOPA bill. ...your company is supporting the SOPA bill because the ESA is representing it in Congress. Lots of people work for these companies! If you work at one of these companies talk to your boss and get them talking to the ESA! Ask what your company's stance is! If you love those companies, get on your favorite company's forums and complain that they are letting the ESA support SOPA by proxy! And consider writing the actual ESA as well (see below). The Entertainment Software Association (ESA) has done a lot of good for the video games industry, including facilitating the landmark Supreme Court ruling that games should be protected by the First Amendment like books and movies, and promoting STEM to further games and learning. Unfortunately the ESA is still shown on the SOPA support list. The "Stop Online Piracy Act" bill will be voted on some time this year (probably soon). The proposed bill will likely stifle innovation and self-expression on the internet, and grant corporations plenty of power to abuse, given the broad manner in which the bill is written. If you're wondering what the fuss is all about, here's a detailed explanation as to why constitutional scholars believe the bill infringes on the First Amendment, and a general overview of what the bill is about. Recently Sony Electronics, Nintendo, and Electronic Arts have stopped their direct support of SOPA. But as long as the ESA is still listed, the game industry as a whole is supporting SOPA. I know The Internet has written and complained about SOPA so it feels like someone else is handling this--but this is gaming. 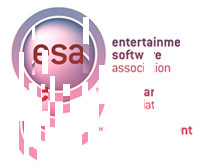 Gamers are being represented by the ESA saying we *support* SOPA. If you don't agree with this then please write the Entertainment Software Association, whether you're a gamer or game developer, and ask that they withdraw their support for SOPA as soon as possible. Please send him your email as well (I've sent one there and it's not bounced at least). In addition, here are all current companies listed as ESA members. They will have further ability to convince the ESA to drop SOPA support, so please write them as well. If you need a kick in the pants, here's my simple email I've already sent to the ESA. Please use it as a starting point, or even better, write something better from scratch! Hello, I'm a gamer and game developer. I want to thank the Entertainment Software Association for their brave work over the years, such as getting video games recognized by the Supreme Court as important forms of entertainment protected by free speech. The ESA is certainly a powerful force within our government working for the video game industry. But one area of the ESA's work that is very troubling is your association's support of the Stop Online Piracy Act. The proposed SOPA bill is an overreaching, broadly worded bill that will surely give too much power to some groups and result in excessive, stifling internet censorship. I agree internet piracy is an issue but this bill is not the answer. Many, many political and technology experts have come out opposing the bill, yet the ESA remains in support of SOPA. The ESA represents the video game industry, including companies such as Sony Entertainment and Nintendo which have dropped support for SOPA. This bill is bad for the internet and bad for the video game industry. Please show the world that the game industry does not support SOPA, and please have the ESA withdraw support for SOPA.